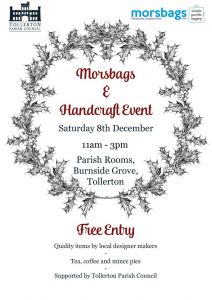 Begin the Christmas spirit and pop along to the Morsbag and Handcraft Mini Christmas Market on Saturday 8th December, from 11am – 3pm, at the Parish Rooms, Burnside Grove. Free entry. Quality items by local craft makers. Serving Tea, Coffee and Mince Pies.